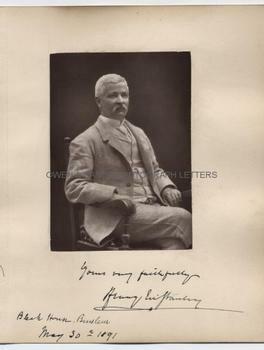 SIR HENRY MORTON STANLEY Photograph Signed. British (Welsh) African explorer and journalist. Noted for his expedition in search of Dr Livingstone and for the Emin Pasha Relief Expedition. Photograph mounted on card and signed on mount below photograph "Yours very faithfully, Henry M. Stanley. Bleak House, Burslem. May 30th 1891." The portrait is a fine 19th century gelatin silver print photograph showing Henry Morton Stanley half-length, seated and turning, rather stiffly, to face the camera. It measures approx. 5.5 x 4 inches excluding mount and approx. 9.5 x 7.5 inches including mount. The card mount is taken from a photographic record album compiled by William Woodall of visitors to his residence, Bleak House, Burslem in the Potteries. Notable guests of the house were invited to sign the visitor's book, to which Woodall had mounted photographic portraits. On the reverse side of this photograph of Stanley is a photograph of Marion Furniss (wife of the artist and illustrator Harry Furniss), signed by Mrs Furniss on the mount below her photograph. Both sides of the page and the photographs they contain are in fine condition. Sir Henry Morton Stanley stayed with William Woodall on the night of May 30th 1891, having given a talk in Burslem on his African travels. Woodall, an influential and radical Liberal MP, was also a trustee of the Wedgewood Institute and was often able to persuade notable men and women of the day to deliver talks and lectures to the Institute. Amongst Woodall's papers was a letter from Stanley's wife (not included with this item) which stressed to Woodall how tired and exhausted her husband had become and saying that Stanley would not like any special arrangements for his visit but, instead, would be happy to sit quietly in Woodall's house and read a book.